Healthy Easter treats that taste as good as they look. 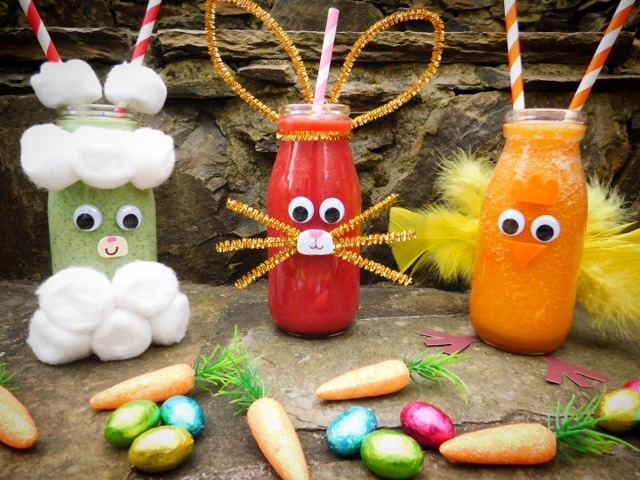 Easter craft and food combine in these oh so cute, delicious and nutritious fruit and vegetable smoothies. Perfect for Easter breakfast or brunch and the ideal antidote to all those Chocolate Easter Eggs! Great fun to make for or with kids this Easter. Chocolate, hot cross buns, chocolate, roast lamb, chocolate, simnel cake, chocolate... Easter is second perhaps only to Christmas as far as feasting dates go. 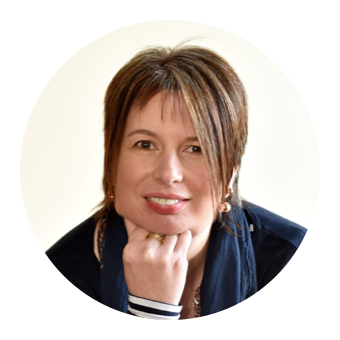 Like so many holiday occasions it can be somewhat of an overindulgence when it comes to eating, drinking and being merry. All of a sudden chocolate becomes acceptable at pretty much any time of the day! As an antidote to all of the above today I'm sharing a fab selection of Fruit & Vegetable Smoothies. 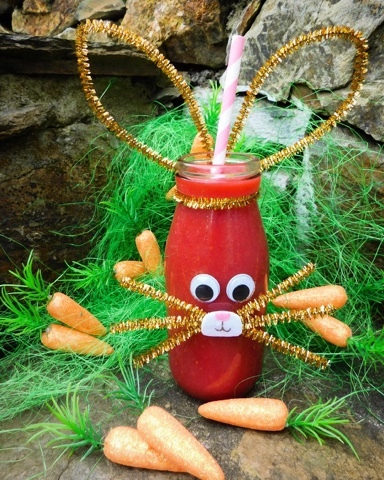 For the Easter Bank Holiday weekend my friends at Iceland foods asked me to come up with a recipe with the theme 'Easter Fun – Foods that aren’t what you think they are'. The only stipulation was that I had to include frozen fruit and vegetables and that my end product should be creatively presented to look like something else. I reckon that I've hit the nail firmly on the head with this one! The bank holiday weekend is set to be a proper scorcher so the #PowerOfFrozen will help you to keep cool, calm and collected. Frozen food can really take the strain off at seasonal get togethers and give you more time to spend with family and friends rather than slaving over a hot stove. Iceland have got everything instore that you'll need for Easter from roasting joints to trimmings and showstopping desserts to award winning hot cross buns. I always have a selection of their frozen fruit and vegetables to hand in my freezer. They are so convenient, avoid waste and are just perfect to help aim towards the new 10 a day guidelines. Freezing fruit and veg at the seasonal peak of perfection locks in the freshness until you're ready to use them, keeping them at their most appetising and nutritious. 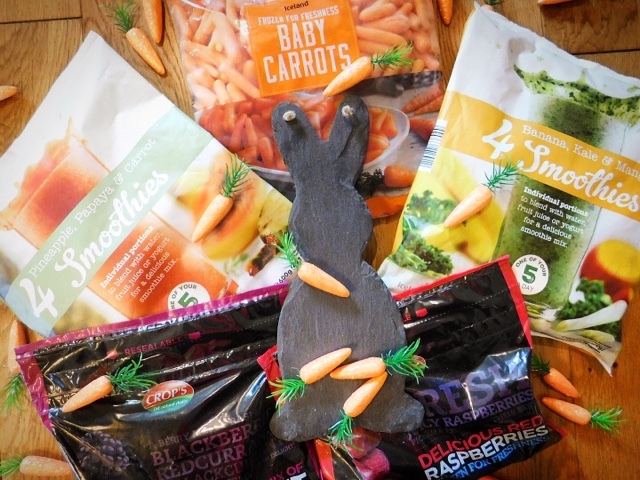 I love the convenience of Iceland's individual smoothie portion packs and we had great fun using them along with frozen rasps and baby carrots to come up with our Happy Easter Smoothies. 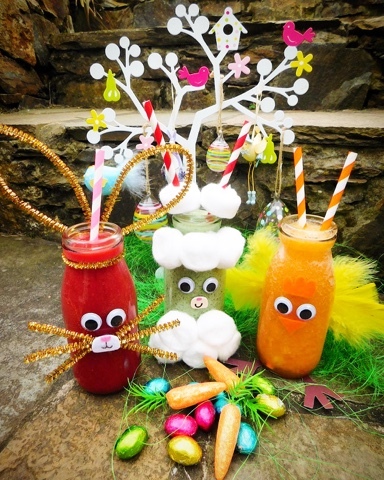 First you'll need to make your Chick, Lamb and Bunny drinking receptacles. I used mini glass milkbottles but you could use regular glasses or disposable plastic tumblers. You'll need to raid your craft box and/or buy a couple of cheap (should that be cheep?!) 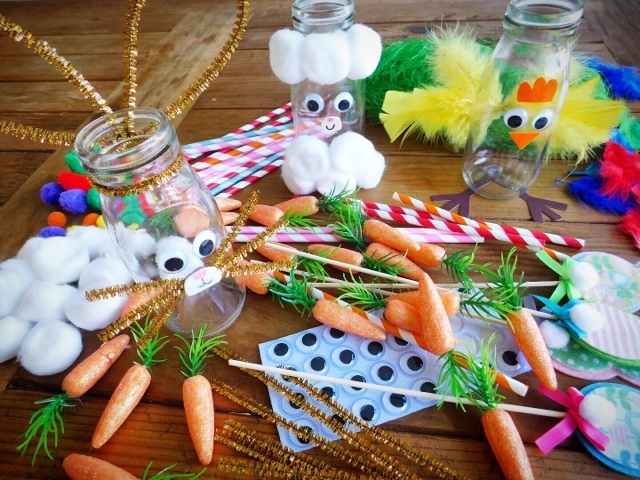 kids Easter craft packs at the supermarket or pound shop. I am SO not a craft blogger so if I can make these anyone can! Easter Lamb - cotton wool balls plus two threaded through straws, googly or drawn on eyes, felt/cardboard nose & mouth. Easter Chick - googly or drawn on eyes, felt/cardboard comb and beak, feathers, cardboard feet. Easter Bunny - googly or drawn on eyes, felt/cardboard nose, pipe cleaner whiskers and ears, cotton wool ball tail. Put the ingredients in a blender and blitz until smooth. Pour into a Lamb and enjoy. Pour into a Chick and enjoy. ...who loves Iceland's Baby Carrots as much as we do? The Easter Bunny! Pour into a Bunny and enjoy. Having frozen ingredients handy in the freezer is a great way to be able to make smoothies anytime you please. You've been very creative, and the Easter themed bottles are very sweet. Frozen produce is so handy full stop not just for smoothies but I do love how quick and effortless it makes their preperation. These are so cute! I love that they're a healthier way to celebrate Easter, especially with kids. Helps to give a bit of balance to all the chocolate! Indeed - it's all abaout balance so rather than a chocolate egg in each hand they can have an egg in one hand and a smoothie in the other! Omg! These are the cutest smoothies I've ever seen!Kids would definitely love drinking from such beautifully decorated bottles. I reckon both big and little kids would enjoy them just as much! He is my favourite flavour. The Raspberry, Orange, Carrot and Maple Syrup work SO well together. We make frozen smoothies all of the time but we don't make them this cute! These are adorable and I like all the flavor combinations you came up with the frozen foods. Definitely a great antidote to all the chocolate. I'll admit that mine aren't always served up this cute but they do always taste good. These are so cute!!! This is a great idea for a fun craft to do with kiddos around this time of year (+ sneak some spinach in their smoothies!). I reckon they would also work well year round for themed birthday or baby shower parties. Such a good idea. I admire your dedication dressing up the bottles!!! They were actually pretty easy to do once I'd decided upon a plan of action. I'm all about simple but effective! 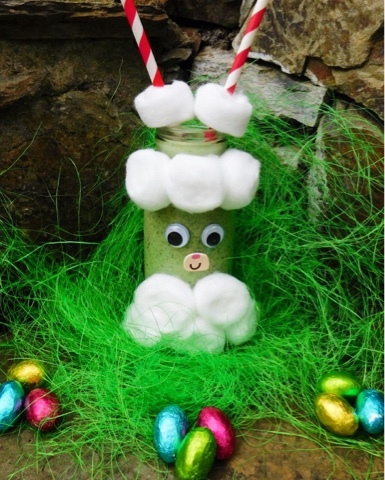 I'm a HUGE smoothies girl, and it's such an awesome idea to dress up the mason jars for Easter! So adorable! Thanks Casey. Anything that can encourage more fruit and veg into kids has got to be good. Cute and Tasty is a winning combination for sure! This takes me back to when I was a kid, decorating jars as snowmen and so on! 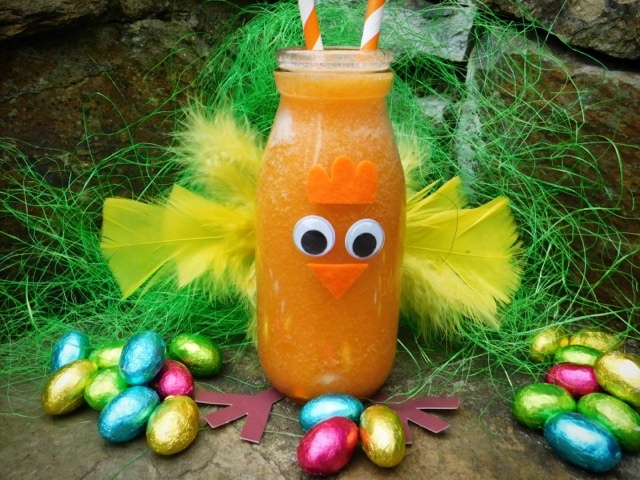 Such a great idea to serve smoothies for Easter! I'm going to have to remember your suggestion for a potential batch of Festive Smoothies! These would look so cute for Easter breakfast or brunch. A healthy way to eat fruits and veggies. Love the decorating of the jars to. Perfect little craft for the kiddos. Ideal activity to keep the kiddos occupied over Easter and stop them guzzling chocolate for a short while! It's all a question of balance. Chocolate Egg in one hand, Easter Smoothie in the other! They are sooooo cute! I can't wait to get the craft box out and make them with my kids. Thanks Kate! Hope you and your kids have fun making them. Aw these are super cute for little ones.